In Search of Luca : Superga - A National Tragedy. Wednesday May 4 1949. A date unfamiliar to many football fans outside of Italy. 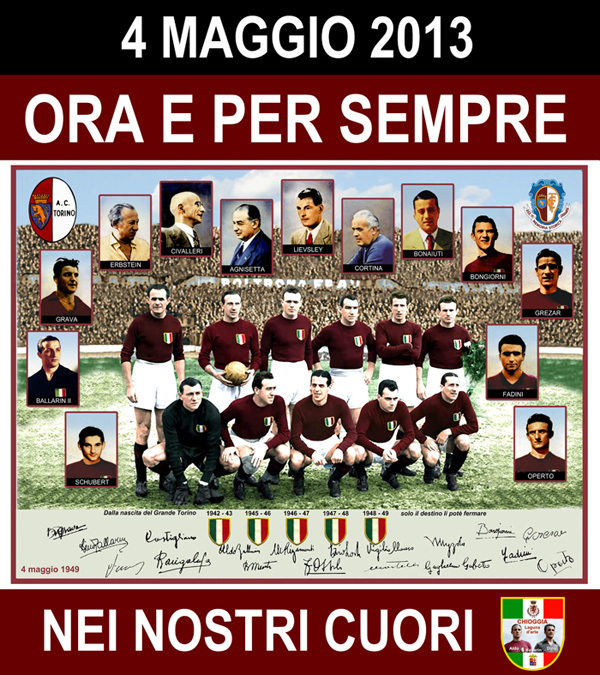 A day that changed the course of Italian football forever and had a monumental effect on one team in particular. A team who, over 60 years on, have never really recovered. On that fateful day, the Superga Air Disaster occurred. A plane, carrying the all-conquering Torino team of the 1940’s (famously known as Il Grande Torino) crashed into Superga Hill near Turin, killing 31 people on board, including all 18 players. The squad were returning home following a friendly match in Lisbon. The Fiat G-212CP plane was heading into a thunderstorm in Turin, and encountered low cloud and poor visibility. In the area around Superga Hill, visibility was down to just 40m. The pilot was then forced to descend to be able to fly ‘visually’. It was during that descent that the aircraft crashed against the base of the rear wall of the Basilica, which stands at the top of Superga. The causes of the crash were recorded as low clouds, poor radio aids and an error in navigation by a vastly experienced pilot, Pierluigi Meroni. The task of identfiying the victims fell to ex-national team manager, Vittorio Pozzo. Many of the bodies had been burnt beyond recognition. Some could only be identified from documents found in their pockets or by rings on their fingers. Pozzo was now a journalist for La Stampa, the Turin based daily newspaper. That evening he wrote "The Torino team is no more. It has disappeared, it is burnt, it has exploded..." He ended by saying "...the team died in action, like a group of shock troops in the war, who left their trenches and never came back". The emotional impact of the crash on Italian sports fans was profound. The team was the vision of club President Ferruccio Novo. The side he had created were the darlings of Italy. With the majority of the team aged just 30 or under, this was a team set to dominate. Il Grande Torino had won four consecutive league titles (1946-1949) and had virtually clinched a fifth title when the disaster occurred. Torino played out their four remaining fixtures, shortly after the disaster, consisting mainly of youth team players. As a mark of respect, their opponents did the same. Torino were awarded the championship title. The team holds the record of most consecutive league titles jointly with Juventus at five. Torino scored 483 goals in five seasons between 1945 and 1949, conceding only 165. Their captain was Valentino Mazzola, simply known as Captain Valentino. He captained the team to all five championships and was an inspirational leader. The oldest player to perish in the disaster was centre-forward Giuseppe Gabetto (33), the youngest was midfielder, Rubens Fadini, aged just 21. There was some initial confusion after the crash as it was reported that Mazzola did not make the trip. It was thought that he had remained at home, due to a fever. Sadly, these reports turned out to be false. Two days after the crash 500,000 people attended the funeral procession in Turin. The streets were packed with mourners and the event was transmitted live on national radio. Coffins were transported through the streets on huge lorries, each bearing the name of the deceased. That same day over 30,000 people climbed Superga Hill to pay their respects and leave flowers. On the front wall of the Basilica a plaque commemorates those who died. Superga remains to this day a site of annual pilgrimage. This team was truly remarkable. With the advent of the European Cup in 1955, Torino would have had the chance to become the most successful club side in the world. They never got that chance and it was Real Madrid who took up their mantle and dominated Europe. The disaster left the Italian national team (known as the Azzuri) in tatters. Torino provided 10 players for the Azzuri, who at that time were the current World Cup holders after winning the 1938 World Cup (their second title in a row). In the five World Cup tournaments that lay ahead, they could only manage the first round in four, they didn't even qualify in 1958! It wasn't until the 1970 World Cup that they made it past the first round. Superga's effect lasted longer than many would have imagined. And what of Torino? Well, they slowly rebuilt the team but have since been overshadowed by city rivals Juventus. Since Superga, Juve (backed by the wealthy FIAT empire) have won the league 22 times to Torino's one (a lone Scudetto in 1976). The balance of power in Turin shows no sign of shifting any time soon. Wednesday May 4 1949. A date I will never forget having recently read John Foot’s brilliant book Calcio, a history of Italian football. Read it. Excellent piece of writing Ian!